Google Blog Search Beats Technorati 3-0! Than Never To Have Blogged At All! She is a blogger blogged. 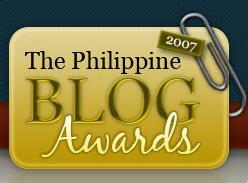 05 April 2007: Mae Lynn L Paulino, you who are engaged to Johnny Depp and who had a fling with Hugh Jackman, I’m reading your 29 March blog about ‘The Stress That PBA Brought’, referring to the The 1st Philippine Blog Awards. I can hear your heart break, you who are ‘so fed up in reading how undeserving’ you are being nominated as one of the finalists in the Personal Blog category. Shari Cruz as Misteryosa won and you lost; if you ask me, it’s okay; in being nominated, you were a winner already. You can’t win them all. You say of your very own The Last Leaf Designs and Chronicles: ‘This site is full of crappy and stupid posts which (are) important to me, which (enable) me to take out the stress, sadness, loneliness, anger or whatever negative feeling I have.’ Precisely! Crappy and stupid my posts may be, I blog what is important to me. Another way of putting that is this: I blog, therefore I am. Blogging is personal above everything else. That’s the first reason for blogging. That’s why I believe blogging is the best thing that ever happened to writing – it became really personal, and almost no holds barred. You can show your best foot forward, or you can hide it. Me, I simply borrow my daughter’s Sony DSC-S60 Cybershot, shoot myself on the foot, and brag about it. My grammar & spelling are now impersonally taken care of – I just have to remember to use a word processor like Microsoft Word, or Google Docs. And since publishing a blog is almost no sweat, and no censor or reviewer can stop the process, I believe blogging is the best thing that ever happened to publishing. You become your own best, or worst, critic. I, Writer have become my own publisher – that is the miracle that blogging wrought. You of little faith! Why do you look for a miracle outside of your own blogging? At the The 1st Philippine Blog Awards night at the CPR Auditorium on the 4th floor of the RCBC Plaza at Ayala Country in the City of Makati last Saturday (31 March 2007), with ‘A Blogger’s Prayer,’ Fr Stephen Cuyos, you made me laugh on the outside, you made me cry in the inside. So compassionate, so faithful, so loving You are Our Father. We ask You to increase our faith and our love for You that we may use blogging as an instrument to fulfill Your purposes. May we become bloggers of truth and promoters of peace. Help us to be steadfast in our Christian commitment that visitors may find in our blogs a source of encouragement and inspiration. Give us strength to proclaim Your word, that we may play our part in breaking down the walls of hostility in the world and use our blogs to strengthen the bonds of friendship, solidarity and love. 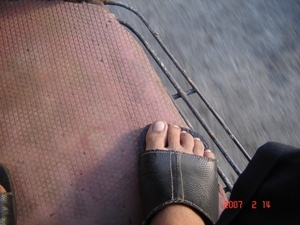 that we may be more concerned about helping the less privileged than about the number of subscribers to our RSS feeds. Deliver us, Father, from spams and viruses, from pride and selfishness, and from the temptation to replicate images without permission and copy ideas without crediting the original authors. May we always be united as a network of bloggers and friends working together in Your name. May our blogs lead us closer to You. We ask all these through Christ, Our Lord. Amen. Language. I hardly noticed it that night, but now I have: The prayer is in English and we are in the Philippines. I love it! You can be an ultra-nationalist, or ultra-conservative, or ultra-naïve like the Ilocano that I was (now I’m only naïve and Ilocano), you don’t have to know HTML but you can’t blog if you don’t (or your Girl Friday doesn’t) know English. English is the richest language in the world, bar none; ergo, it is unwise, may uneducated, for us to ignore it in favor of our own when we know that our own is inadequate for international intellectual exchanges. The medium is the message. The medium is English; the message is English. The battlefront today is IT, and if you don’t master your English, you’re OUT. I’ve been married to a Tagala from Nueva Ecija for the last 40 years but I have never been in favor of Tagalog as the only basis for the national language; now that I realize the Cory Constitution of 1987 effectively outlawed Tagalog as that unique, prejudicial basis of a national language, 20 years later I can exult. Better late than never! lead us closer to You. There are other words repeated, such as You & Your (7), more (4), friends & friendship (4), love & loving (3), often (2), Father (2), faith & faithful (2), Christ & Christian (2). But none of these has the impact of our, our, ourselves; we, we, we; us, us, us! All these numbers tell me that the hidden agenda of ‘A Blogger’s Prayer’ can be stated in 2 letters: US. Not I, not you, not him, not her, not them. US. Here are other words in the prayer that suggest that message: blogrolled, bonds, friends, love, neighbors, network, peace, united, solidarity, together. US. Therefore, I say, no one else has been hiding in the Emerald City but a certain Fr Stephen Cuyos MSC who is none other than The Wizard of US.